HuntingClothesPro: Just Doing It For Fun! Kids Get a Chance to go Hunting. Just Doing It For Fun! Kids Get a Chance to go Hunting. This article is so awesome! It is about my brother and his friends starting a group called Chops Waterfowl. They take young kids, disabled kids and young adults or pretty much anyone who may want to but has never had the chance to go duck hunting. The awesome part about this is that they don't do this for money, they just do it for fun! Last year they were able to took out 15 different first time hunters, gave out 25 duck calls, t-shirts, hats and had an outstanding experience taking out a double amputee. For this year, they already have about 20 hunters already scheduled. 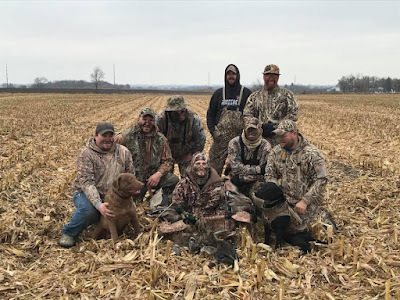 I have been able to go with them out hunting with a group of kids and it was awesome to see the kids faces when they shot a duck or goose or at the fact they were able to make it out duck hunting. If you leave in Wisconsin and know kids that haven't gone waterfowl hunting and want to go. You can check out their Facebook page Chops Waterfowl. Picture of the Chops Waterfowl with one of their hunters they were able to take out.